Most of us are familiar with the names of Galland, Hartmann, and Barkhorn; but what about Resnak, Kovarik, and Stoyanov. The latter three are just some of the pilots you will read about in Osprey’s latest in the “Aircraft of the Aces” series. This 96-page book concentrates on the Slovakian and Bulgarian aces that took to the air in the lead up to and during World War II. The story begins with the Hungarians crossing over the Slovak eastern border on 23 March 1939. The fledgling Slovakian Air Force took to the air but suffered as a result of accurate Hungarian anti-aircraft fire. They lost aircraft that day and on the 24th, the Avia B 534’s first encounter with Fiat CR.32 fighters also resulted in Slovakian losses. Such was the Slovakian Air Force’s introduction to combat. The 28th March saw peace between these two combatants and the next action seen by the Slovaks was supporting the Germans at the beginning of WWII. Here they gained their first confirmed kill on the 6th September. A re organized Slovak Air Force took to the air during the battles on the Eastern Front against the Soviet Union, ironically fighting along side the Hungarians. In 1942 the Germans introduced them to the Bf 109E and later the F and G models. For operational purposes they were assigned to II./JG 52, appearing in German records as 13(slow)./JG 52. Circumstances did see some defections and it is for this reason that some of the aces are seen flying Soviet aircraft later in the war. The authors take the reader through informative descriptions of these battles and the style of writing is very easy to digest. Narratives by the pilots themselves are spread throughout the text and their inclusion is most welcome. The result is not a text that reads like a “who shot whom” but one that lets the reader into the mind of the pilots concerned. Although not as well known as airmen of other nations, it certainly was not through any lack of bravery. Take for example an action that occurred when three Slovak B 534 biplanes of 13 Squadron were escorting a Henschel Hs126 during a reconnaissance. Catnik Frantisek Brezina’s aircraft was hit by flak and he had to make an emergency landing deep inside Russian territory. Brezina’s aircraft was soon under heavy Soviet arms fire so Catnik Stefan Martis, one of the other B 534 pilots, started to strafe the Soviet soldiers in an attempt to save his friend. He then landed his aircraft allowing Brezina to jump on the lower wing and immediately tried to take off. The Soviets continued to fire at the fleeing aircraft and despite Martis receiving a wound in the leg, was able to get his aircraft airborne. Brezina however could not hold his balance and was left hanging onto the strut until it was safe enough for Martis to throttle back for Brezina to regain his footing. Bulgaria was neutral during the early years of WWII but pressure soon saw her sign the Tripartite Pact with Germany, Italy and Japan. When the latter attacked Pearl Harbour in December 1941, Bulgaria was obliged to declare war on the USA and Britain. The fate of the Vazdushni Vojski (Bulgarian Air Force) and the highest scoring pilots that represented her is covered from chapter five. Again we read some very insightful first hand accounts that not only describe the actions in question but also give a run down on the tactics used. An example of bravery in this organization comes in the form of Dimitar Spisarevski. Immediately after shooting down one B-24 he deliberately rammed another at full speed cutting off its tail. Here we read about the account from not only the combat diary, but also a gunner from the stricken bomber and an escorting P-38 pilot! John Weal does a good job of the colour section with 39 aircraft portrayed. There are quite a variety of machines illustrated including Avia B 534 biplanes, an La 5, La 7s, D.520s and the expected Bf 109 E and Gs. The captions to these profiles are very informative and compliment the text very well. The book is interspersed with a nice selection of photos showing the men and their aircraft. Although generally well reproduced, the quality will depend on the original print. 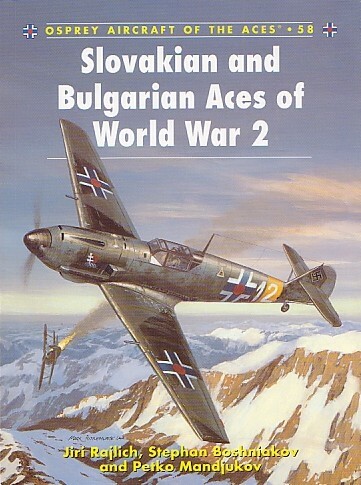 An appendix provides a list of all the Slovak Aces including details of their victory claims. The top scoring Bulgarian fighter pilots are also recorded as well as the “points” system they used for aircraft attacked. This is an interesting book about aviators that are not generally known outside of their native lands. The authors have done a fine job of relating their exploits in a colourful and easy to read manner.